W hen you have a water leak, you need to take care of it quickly. If you can't find the source of the leak yourself, you need to find someone to do the water leak detection for you as soon as possible. The quicker you are to find the leak, the better chances you have to extract all the water and restore the water damage. It's easy to know you've got a water leak when the living room ceiling collapses. Unfortunately, the signs can be way more subtle, and your water leak can cause some real damage before it's discovered. A. Any delay in treating the water leak will have disastrous consequences on your property. Water causes more damage the longer it is around, and prompt leak detection is key to stop the water flow and start water damage restoration. B. If you wait with water damage restoration and leak detection, the insurance company may not cover it. Most homeowner's insurance policies will cover sudden onset of water leaks and the damage they incur, but not ongoing water damage that was left untreated. That is also the reason some mold growth and mold remediation aren't covered by the insurance - mold growth indicates of an untreated water problem. Once you have discovered where the leak is coming from, it's time to do an in-depth inspection of the property and see the damage it has done. We hope a simple fix of the leak followed by water extraction will be enough to rid you of the problem, but in our experience - that's not the common case. 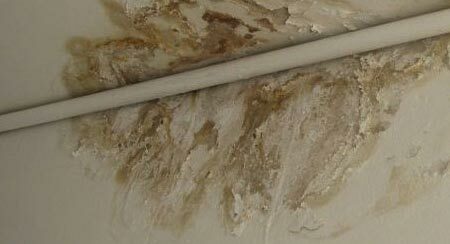 A water leak indoors would require at the very least water damage restoration and some repair to your property. If you have suspicion of a water leak, you would want to handle it as soon as you can. Water damage increases exponentially as time passes, and the sooner you fix the leak and repair the damage the less problems you'll have. How do you detect a water leak? First of all, if you see water anywhere it doesn't belong, you need to find where the water is coming from. Home appliances, pipes, faucets and any water containing items are the usual suspects. You see swelling or darker areas in your ceiling or walls (or your ceiling fell in, in worst cases). You hear water trickling, but you have no idea where it's coming from (and you're not insane). Your carpets are damp or your floors feel moist. Your basement is humid more than usual. Your water bill is way higher than it should, and feels like everyone in your household have been having 3 hour showers. You see mold, moss or mildew growth in a dry area. If you found any of the above, you need to find out where the leak is. And here you have a few options: Call a professional water damage company who will know where to look and how to look deeper beneath the surface, Call a water leak detection company who may or may not have a thermal imaging camera that'll spot the water without need to dig in, or keep looking yourself. In the process of water leak detection, some inconvenience may be caused - for example, you may need to move furniture or appliances, and in some cases also break a wall or floor to follow the path of the water. Locating a leak may take anywhere from a few minutes in simple cases, and a few days in other cases. We've had cases where the leaky pipe was found instantly, and other instances where a leaky toilet rarely used was the cause of water, and it couldn't be discovered until the whole house was inspected thoroughly. Remember, water damage restoration is a very technical process that requires skills, knowledge and equipment. Moreover, there are industry standards and certifications for those who can restore water damage. Flood Damage Pro is certified, experienced and equipped for any water damage restoration, from the smallest leaks to the biggest storm damage. Call us at 866-869-4167 and get help with your water leak now.